UNITED NATIONS, March 24 -- The UN's panel on accountability for war crimes in Sri Lanka is being put together by Secretary General Ban Ki-moon's chief of staff Vijay Nambiar, with his already controversial role in the final stage of the "bloodbath on the beach" and the Rajapaksa government's UN representative Palitha Kohona, Mr. Ban told the Press on Wednesday. A full week after Mr. Ban said there would be "no delay" in putting together the panel, Inner City Press asked him what had in fact been done. Video here, from Minute 7:54. Mr. Ban replied that he is "in the process of identifying persons" for the panel of experts. "My chef de cabinet has been meeting with Sri Lanka's Ambassador here," Mr. Ban said. Video here, from Minute 8:29, UN transcript below. Chef de cabinet Vijay Nambiar's role in Sri Lanka became more and more controversial as 2009 progressed, including him telling surrendering LTTE leaders that if they came out with a white flag they would be fine. They were, in fact, shot and killed -- at the order of the Rajapaksas, according to now imprisoned general Sarath Fonseka. While UN Special Rapporteur on Summary Execution Philip Alston has submitted questions to the Sri Lankan government, Nambiar himself is at least a witness. Why is he putting together the panel on accountability? Ambassador Kohona, most recently, is reported to have given food baskets and $100 dollars to pro-Rajapaksa protesters who denounced Ban Ki-moon in front of the UN twelve days ago. Kohona was also instrumental in the Non Aligned Movement's letter to Ban contesting his jurisdiction to appoint the panel. India's representative at the NAM meeting at issue has told Inner City Press that at the end of the meeting, essentially as people were leaving, Kohona asked for a NAM letter to Ban. In the moment, no one objected, and the letter was sent. 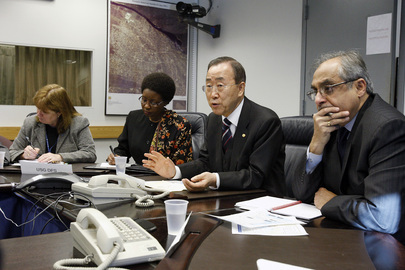 There are the two people putting together the panel to advise Ban Ki-moon on accountability for war crimes in Sri Lanka. It is, one close observer told Inner City Press, like "two foxes studying the hen house." Watch this site. Footnote: Inner City Press also asked China's new UN Ambassador Li Baodong for his views on Ban's panel and the NAM letter. Video here, from Minute 3:00. While Li Baodong answered Inner City Press' question on Myanmar, saying that its elections are a "matter of sovereign states that should be respected," he pointedly declined to answer Inner City Press' question on Sri Lanka, and walked away from the microphone. Video here, from Minute 4:34. Inner City Press: a week ago you'd said on the Sri Lanka panel or board on accountability that there'd be no delay. So a week's gone by, I want to know if anything's been done in that regard in that week? SG Ban: I'm in the process of identifying persons who can work in the panel of experts. My chef de cabinet has been meeting with the Sri Lankan ambassador here and they are now in the process of making a move on this, and I expect that Mr. Lynn Pascoe will be able to visit Sri Lanka in the near future to discuss all the matters. On Sri Lanka, UN Puts Spin on "No Delay," Jabs at NAM, Will Fonseka Meet Pascoe? 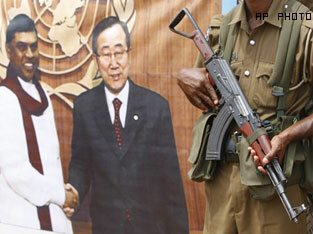 UNITED NATIONS, March 18 -- Amid charges by the UN that the Non Aligned Movement's letter defending Sri Lanka's Rajapaksa government was not agreed to by all NAM member, notably India, the UN is insisting there is no contradiction between its statements about a panel to advise Ban Ki-moon about approaches to war crimes in Sri Lanka. On March 18, Inner City Press asked Ban's Associate Spokesman Farhan Haq about his quote that the panel would not be established very soon and Ban's March 16 statements that there would be "no delay." "To many it seems contradictory," Inner City Press began. "By many you mean you?" demanded Farhan Haq. Video here, from Minute 7:55. Well, no. Even after the briefing, a number of UN correspondents who neither ask nor write about Sri Lanka approached Inner City Press to say they too found it confusing, no delay but not very soon. Haq tried to square the comments by saying no delay in considering the terms of reference. Presumably Ban considered this before informing Mahinda Rajapaksa he was going to name the panel. Again, timing in this regard should be compared to Guinea, where the September 2009 killing of 150 civilians has already triggered a UN panel, terms of reference and investigation long completed. No delay? Senior Ban advisors have told Inner City Press that they are mad at the NAM letter, claiming that India for example did not agree to the letter. Inner City Press is inquiring. For now, Inner City Press has obtained the NAM letter -- the Sri Lankan Mission to the UN declined to provide it to the press -- and puts it online here. Just as the "no delay" panel may in fact be intentionally delayed past Sri Lanka's April election, so too many the trip of Ban's envoy Lynn Pascoe. The question is, will Pascoe as least ask for, and hold out to receive, permission to meet with Sarath Fonseka, the imprisoned opposition candidate and former general? One cynic pointed to the UN asking to meet in Myanmar with Aung San Suu Kyi. Another senior Ban advisor said that the Sri Lanka "case calls out of investigation" even more than Guinea, in that the "general who shot the gun at people with white flags" is saying he was ordered to. But what about the UN official, Ban's chief of staff, who told them to come out with white flags, that it would be ok? Watch this site.